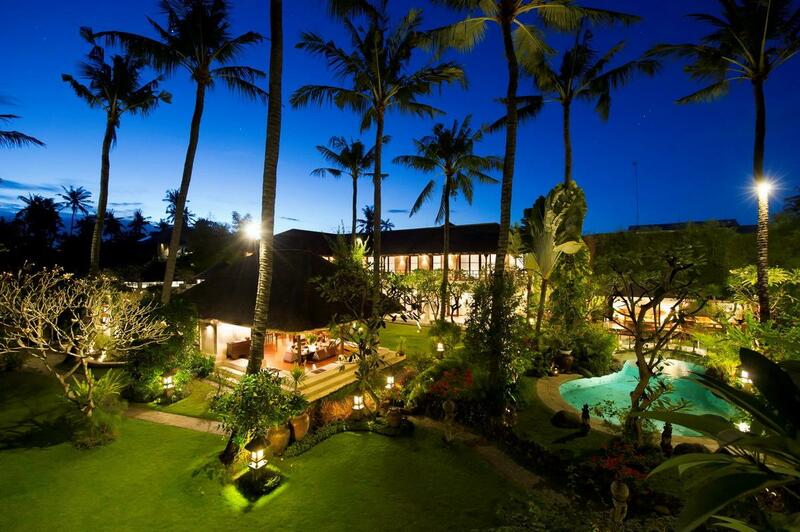 Taman Sorga – ‘heavenly garden’ – is a traditionally inspired six-bedroom villa that accords its guests an authentic ‘contemporary Bali lifestyle’ experience in a peaceful residential area moments from Sanur Beach on Bali’s south-eastern shore. 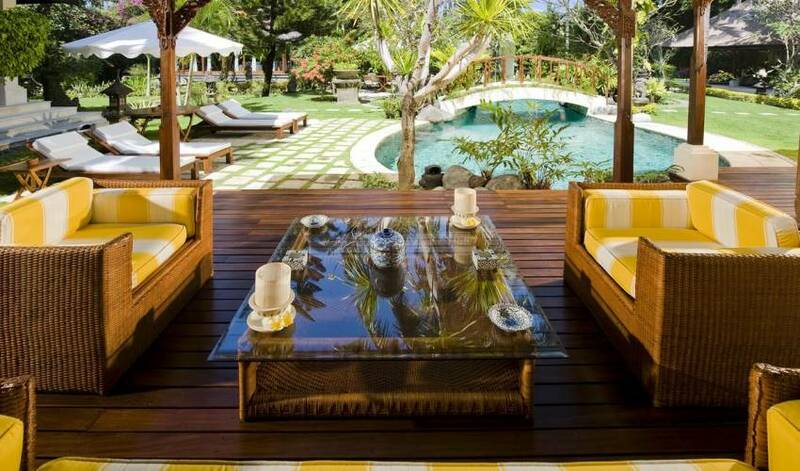 Acclaimed in architectural magazines and design books, this professionally staffed villa is perfect for extended families or groups of friends who will relish the abundant antiques-packed living and entertainment spaces spread over a series of pavilions within private gardens surrounding a glorious 17-metre lagoon-style swimming pool. 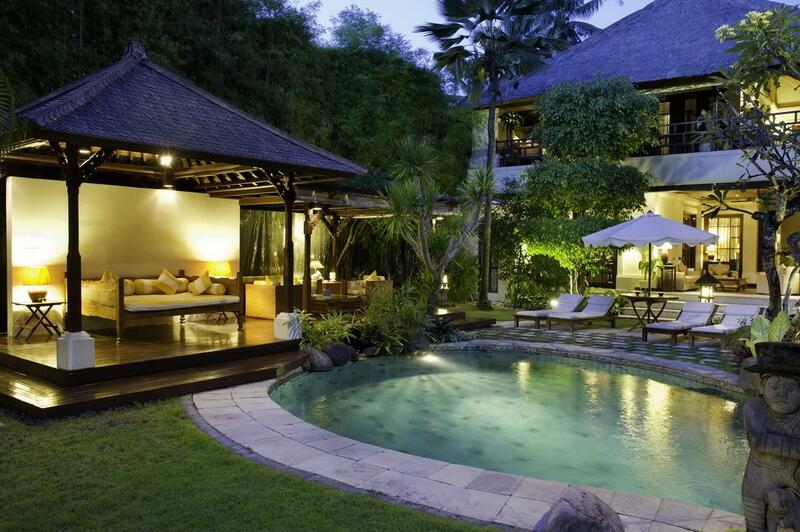 With one glance at the villa’s splendid living pavilion, guests are assured they are somewhere rather special. An entire village of craftsmen from the Gianyar regency spent months working in-situ to create this magnificent artefact-filled structure with its soaring two-tiered roof, intricately carved gilded pillars and Batu Batik wall. 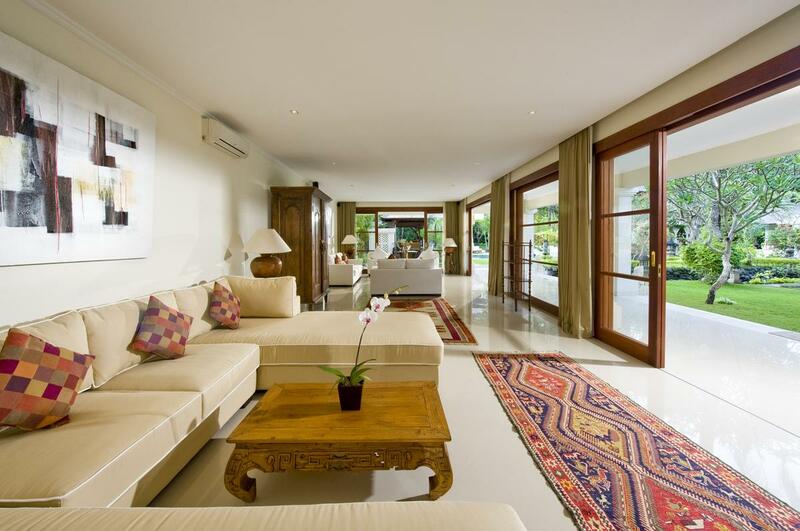 The villa was designed by its long-term-Bali-expat owners as a spacious home for their growing family, revealing a Swiss eye for detail, South American sense of style, and a passion for Bali’s arts and crafts. 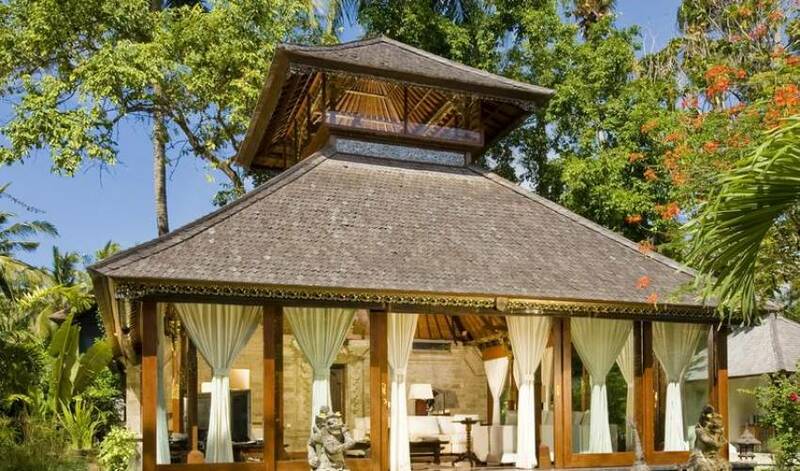 With the addition of a grand colonnaded guest wing in 2010, the villa now juxtaposes traditional ‘Bali style’ with contemporary elements to create a unique expression of tropical Balinese living. Clustered around the curvaceous pool, a series of pavilions house the multiple living and dining spaces, six bedrooms, gourmet kitchen and gym, combining old and new and contrasting heritage treasures with hi-tech amenities: merbau, teak and terrazzo floors meet granite counter tops and marble walls; an antique Singha statue presides over modern leather sofas; flat-screen TVs perch on antique chests; a heritage dresser stands by a hydro-massage shower, and top-range King Koil mattresses grace royal canopied beds: all delightful touches that add to the villa’s unique character. Further 21st century luxuries include jacuzzis, home theatre systems and air-conditioning throughout – even in the bathrooms. And contributing immeasurably to the experience is the long-serving staff team, whose strong attachment to the villa clearly shows in the pride with which they take care of their guests. The villa is ideal for multi-generation families or groups of friends looking to socialise while at the same time enjoying private corners and plenty of breathing space. 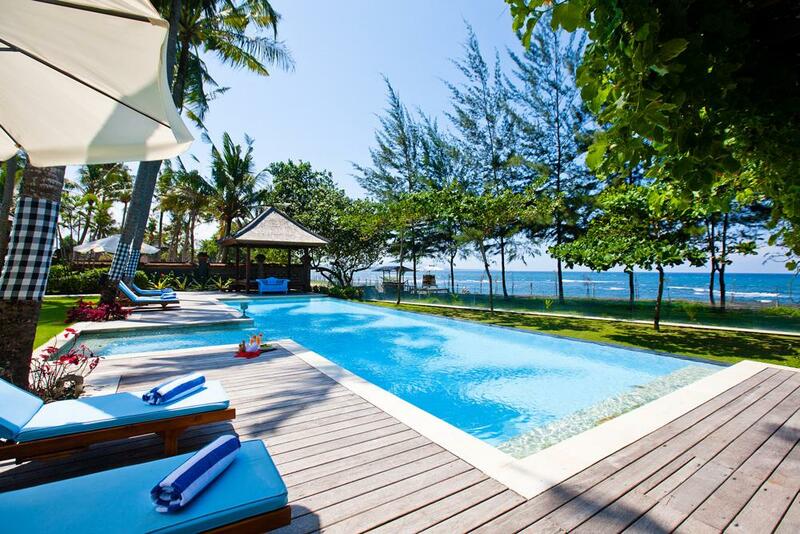 Many guests are so comfortable in this home-from-home that they choose to stay put, but for those keen to venture beyond the estate, there’s the beach to explore, temples to visit, and Sanur’s myriad restaurants, boutiques and spas to discover. 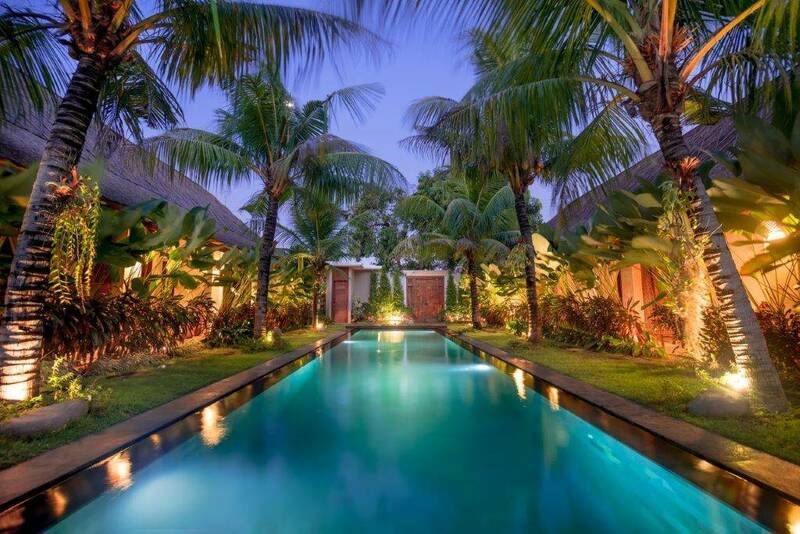 Perfectly combining traditional and contemporary design elements, the villa comprises a series of pavilions oriented towards the lagoon-style swimming pool at the centre of almost 4,000 square metres of lush gardens. 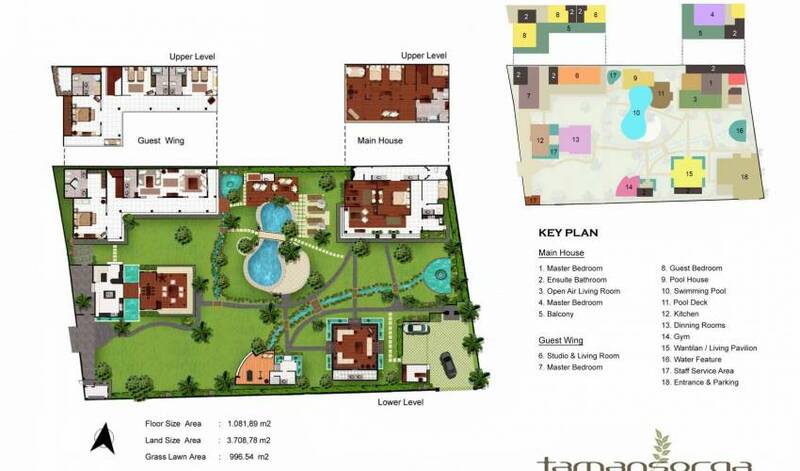 Along one side of the estate, two double-storey buildings house the six spacious bedroom suites as well as a huge media room; all opening onto shaded verandas. Across the lawn is thewantilan living pavilion, a gym, and a separate dining pavilion with indoor and open-air dining areas separated by a lotus pond from the ultra-modern kitchen. 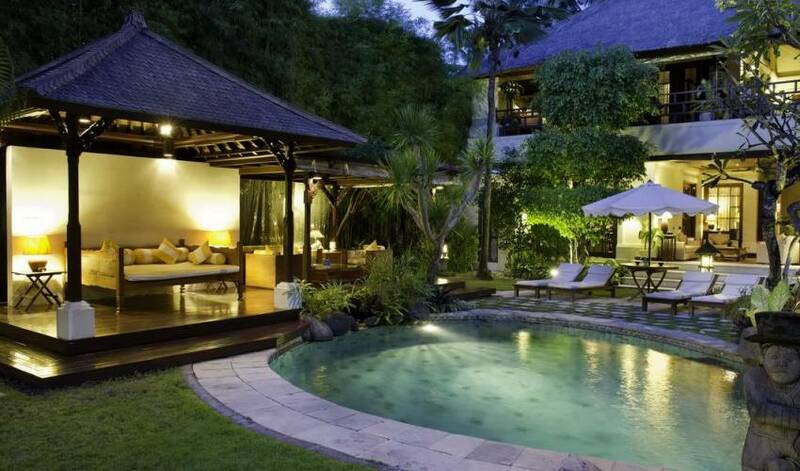 Around the pool is a covered deck with seating, a sunbathing area and a dining terrace. The villa’s magnificent main living pavilion looks out over the garden through three walls of glass sliding doors that can be opened to catch the evening breeze or closed for air-conditioned comfort. 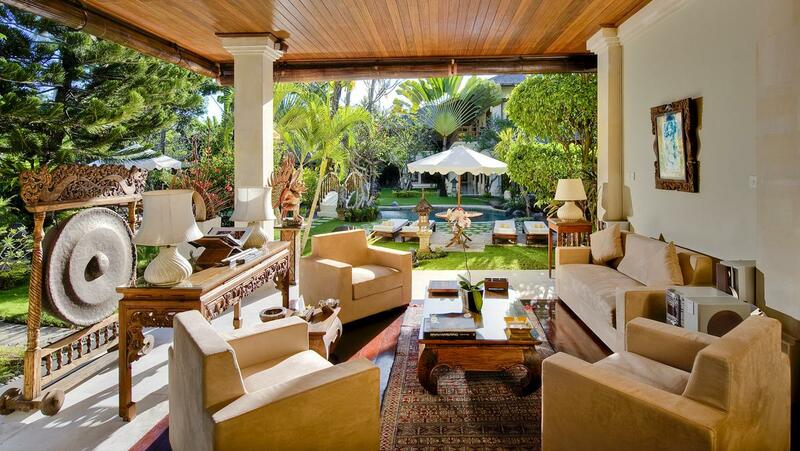 Modelled on a traditionalwantilan meeting hall and hand-crafted by skilled Balinese artisans, this elaborately carved room features a two-tiered roof raised on gilded pillars, antique furniture and artefacts, and oriental rugs and Kilims. 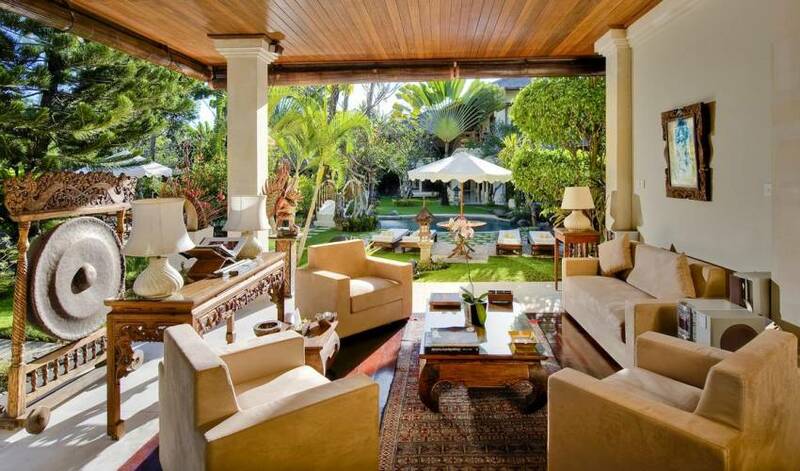 A splendid Singha statue presides over the cream leather sofas set around an enormous antique coffee table. Discreetly tucked away among the antiques is a 42-inch TV and home cinema system. The large terrace of the main house forms a second lounge area, with upholstered sofas and chairs around a colourful Kilim on a Paras-stone floor which flows down steps to the garden. Wrapping around the bedroom above, the huge veranda induces relaxation with its Mexican hammock, antique daybed and breakfast table. Another highly social space is the media studio, a huge air-conditioned room with comfortable sofas defining two separate seating areas, a 50-inch TV with home cinema system and an extensive library of DVDs and books. Within the attached bathroom are twin basins and a hydro-massage shower. Guests gather for convivial meals in the alang-alang thatched dining pavilion, divided into a formal air-conditioned dining room with a teakwood table for 12 flanked by two antique buffets, and an informal open-sided dining area with a circular table for six plus a set of triangular cushions arranged around a low table for Asian-style dining. Across a lotus pond is the air-conditioned kitchen, a Masterchef-worthy culinary palace that’s professionally equipped with everything from Gaggia coffee machine to wine fridge, with breakfast area and 32-inch TV. In the air-conditioned gym, fitness-focused guests can workout on the treadmill or weight station, or follow a Pilates DVD on the 32-inch TV. Conveniently, there’s a shower and washroom attached to the gym. 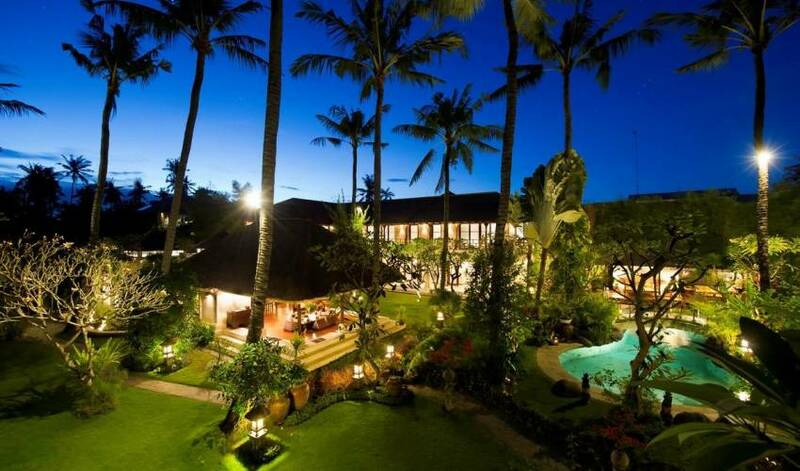 Surrounded by carpets of soft Japanese grass dotted with flame-coloured flamboyants, bougainvillea and pure white plumeria, the 17-metre lagoon-style swimming pool is the villa’s social heart. 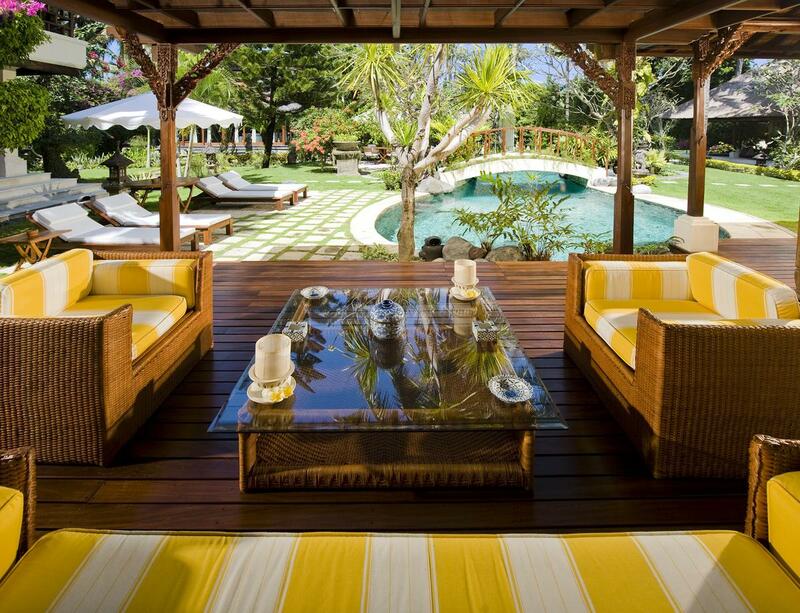 Water cascades create soft background music to the cheerful yellow-and-white seating area on the coveredironwood deck which merges with a pool pavilion featuring an oversized daybed and, tucked away behind, a pool shower and washroom. 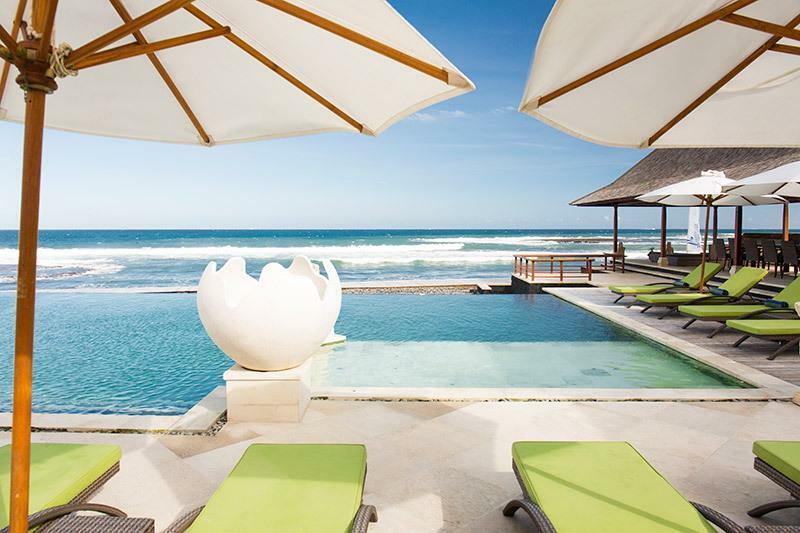 Seven cushion-covered sunbeds sit on the stone terrace, shaded by parasols. At the far end of the pool is a dining terrace with a table for six – the perfect spot for breakfast accompanied by birdsong. 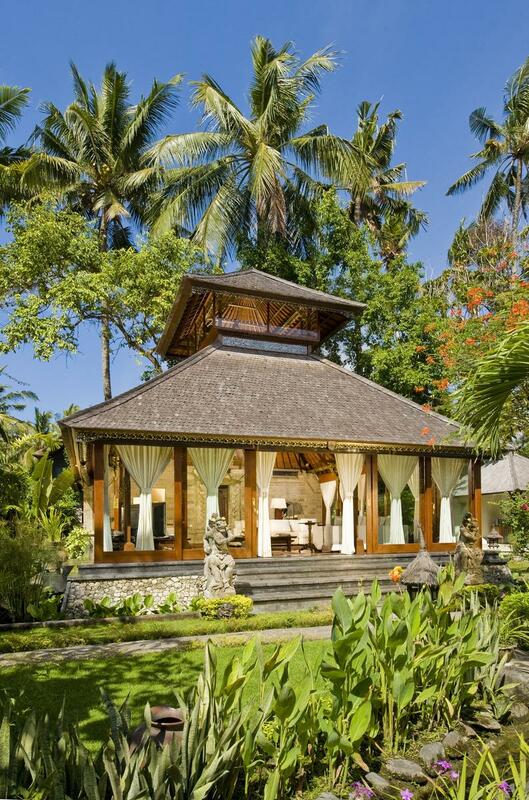 The upper-floor master bedroom suite in the villa’s main house offers guests a unique experience: an antique ceremonial canopy enveloping two four-poster queen-size beds originating from a royal Balinese palace forms the room’s spectacular centrepiece. Rare antiques abound in this huge suite, its Kilim-covered teakwood floors flowing onto the surrounding veranda, where multiple seating areas, including a beautifully carved daybed and a Mexican hammock, invite repose with a garden view. Heritage furniture and ultra-modern facilities co-exist in the ensuite, which features a jacuzzi, hydro-massage shower, and twin basins on a marble vanity. Heirloom pieces are a-plenty in the master bedroom below, which opens onto a comfortably furnished terrace through a wall of glass sliding doors. Inside, a stately king-size four-poster bed rises from the polished merbau-wood floors facing an armoire and ornate colonial sofa. The conservatory-style ensuite features a semi-circular marble-lined hydro-shower enclosure, twin vanities and, beyond traditional carved Balinese doors, a room-within-a-room for the WC. Contrasting the heritage bedrooms are two guest wing master suites with a decidedly more 21st century feel. Opening onto a colonnaded veranda, each is a light-filled haven of relaxation with contemporary furnishings, a king-size bed, comfortable seating and a calming colour palette. The suites include a large dressing room and an enormous marble-lined bathroom with statement jacuzzi, double vanities and a hydro-massage shower enclosure. Equally contemporary in design are the two twin bedrooms on the upper level of the guest wing – one with an elongated window seat gazing over the garden. Perfect for children, these twin beds convert easily to king-size beds for couples, and the ensuite bathrooms include a hydro-massage shower and a bathtub set into a shelf-lined alcove. 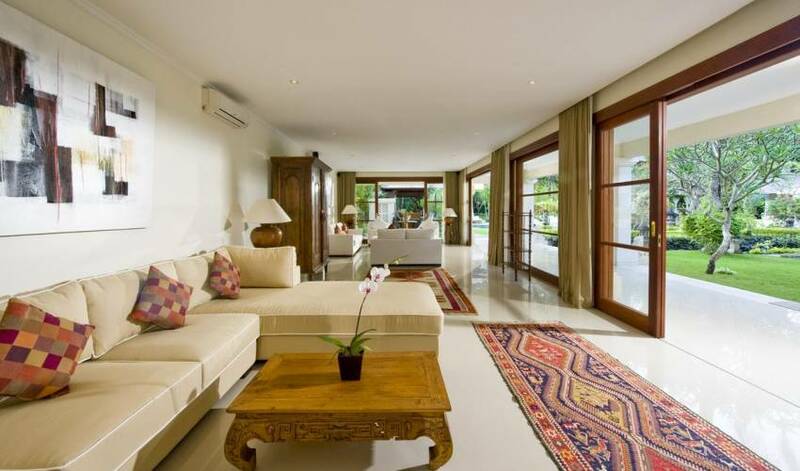 Villa Taman Sorga is tucked away down a quiet tree-lined lane in a mellow residential area of Sanur, worlds away from the bustle of the main tourist area a few kilometres north. Alongside the local warungs (cafés) are some interesting gems, among them Man Friday, serving excellent inexpensive fish and chips, Glo Day Spa & Salon, and the showroom for Carlo Pessini’s collection of contemporary furniture. Five minutes’ walk south brings you to Mertasari Beach, the southernmost stretch of Sanur’s famed golden sands, where you can enjoy seafood and a cold Bintang beer. Heading north are myriad restaurants, among them the villa owners’ favourites – Massimo, Arena Sports Café, and Firestation. Sporting guests have the choice of a nine-hole golf course, wakeboarding, kite surfing, kayaking, surfing and scuba diving, while culture buffs should make a beeline to Le Mayeur Museum and visit unique temples such as Pura Segara constructed entirely of coral, and Pura Belanjong, home to the island’s oldest example of writing. For a day out (and back in time), take the half-hour boat trip to Nusa Lembongan.